When Dawn launched from Cape Canaveral Air Force Station in Florida in September 2007, strapped on a Delta II-Heavy rocket, scientists and engineers had an idea of what Ceres and Vesta looked like. Thanks to ground- and space-based telescopes, including NASA's Hubble Space Telescope, the bodies in the asteroid belt between Mars and Jupiter were visible—but even the best pictures were fuzzy. From 2011 to 2012, Dawn swept over Vesta, capturing images that exceeded everyone's imaginings—craters, canyons and even mountains. Then on Ceres in 2015, Dawn showed us a cryovolcano and mysterious bright spots, which scientists later found might be salt deposits produced by the exposure of briny liquid from Ceres' interior. Through Dawn's eyes, these bright spots were especially stunning, glowing like diamonds scattered across the dwarf planet's surface. "Vesta and Ceres have each told their story of how and where they formed, and how they evolved—a fiery magmatic history that led to rocky Vesta and a cooler, water-rich history that resulted in the ancient ocean world Ceres," said Carol Raymond of JPL, principal investigator of the Dawn mission. "These treasure troves of information will continue to help us understand other bodies in the Solar System far into the future." There was so much that scientists didn't know about Ceres before Dawn arrived. Raymond wondered whether they might find Ceres covered with a smooth, young surface—an enormous cue ball with a frozen crust. Instead, they found the dwarf planet wearing the chemistry of its old ocean. "What we found was completely mind-blowing. Ceres' history is just splayed all over its surface," she said. The findings reinforce the idea that dwarf planets, not just icy moons like Enceladus and Europa, could have hosted oceans during their history—and potentially still do. Analyses from Dawn data suggest there may still be liquid under Ceres' surface and that some regions were geologically active relatively recently, feeding from a deep reservoir. Now, near the end of Dawn's second extended mission at Ceres, the spacecraft has continued to gather high-resolution images, gamma ray and neutron spectra, infrared spectra, and gravity data. Almost once a day, it will swoop over Ceres about 22 miles (35 kilometers) from its surface—only about three times the altitude of a passenger jet—gathering valuable data until it expends the last of the hydrazine that feeds thrusters controlling its orientation. Dawn's reaction wheels failed earlier in the mission, leaving it heavily dependent on this key fuel. 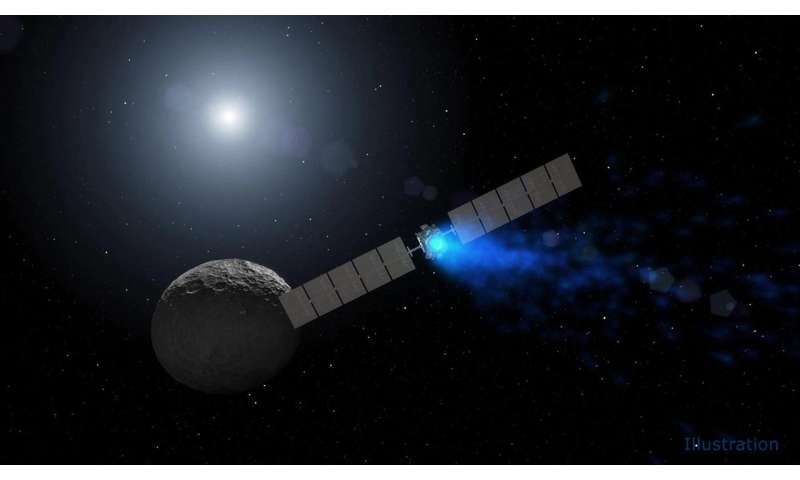 When Dawn runs out in the next month or two, the spacecraft will lose its ability to communicate with Earth, but it must not crash into Ceres. Because Ceres has conditions of interest to scientists who study chemistry that leads to the development of life, NASA follows strict planetary protection protocols for the disposal of the Dawn spacecraft. Unlike Cassini, which deliberately plunged into Saturn's atmosphere to protect the system from contamination—Dawn will remain in orbit around Ceres, which has no atmosphere. Engineers designed Dawn's final orbit to ensure it will not crash for at least 20 years—and likely decades longer.